Sparkle and shine all around with this unique, Asscher Inspired ring. 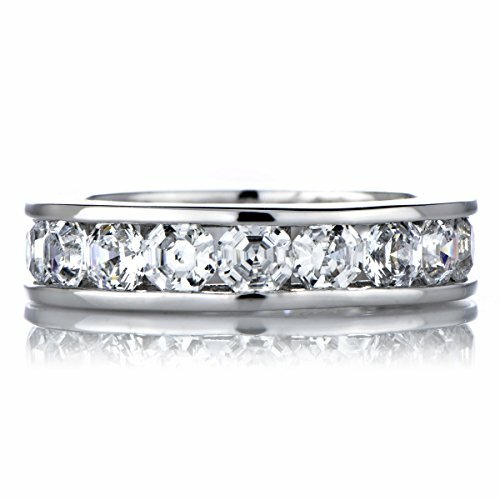 It features cubic zirconia channel setting around the entire band with a goldtone sterling silver border on the top and bottom. Each Asscher Inspired CZ is approximately .25 carats and there are approximately 16 to 20 stones total depending on the size of the ring. The band is 5.5 mm thick and the entire ring weighs 6.5 grams. This ring is even available in size 4. This item is part of our Nickel Free jewelry collection! For more information, or to shop all of our Nickel Free jewelry items, check out our Nickel Free jewelry section! Metal: .925 sterling silver jewelry, Goldtone Stones: Cubic Zirconia, Clear Setting: Channel set Carats: Each Asscher Inspired stone is approximately .5 carats and features approximately 16 to 20 stones depending on the size of the ring. Approx. TCW 8-10 (Depends on ring size) Dimensions: Band is approx. 5.5 mm thick Weight: Approx. 6.5 grams FYI: This item is part of our Nickel Free collection! Compare prices on Asscher Inspired Channel Setting at Shopsimal.com – use promo codes and coupons for best offers and deals. We work hard to get you amazing deals and collect all avail hot offers online and represent it in one place for the customers. Now our visitors can leverage benefits of big brands and heavy discounts available for that day and for famous brands.